Malifaux Musings: Halloween Fluff Week! We’ve got a little bit of a potpourri post today (I have a feeling the fluff/story posts are going to be like this in the future.) 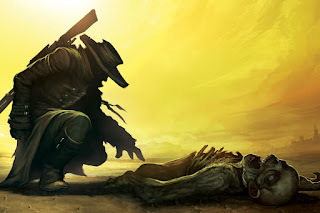 We’ll run through some quick Mini-Musings, take a look at a Dreamer Trick-or-Treating crew I’ve been testing in honor of the holiday, and end with an excerpt from a longer piece of Malifaux fiction I’m working on at the moment, Shadows and Void, themed around the origin of a Death Marshall. I’m planning on turning this into a novel for NaNoWriMo in November, because I’m a masochist and I enjoy hurting myself. So look forward to hearing more about this in the future. -The PDF of Broken Promises is available on DriveThruRPG. So…go get it? Assuming you don’t have it already. I mean, come on. You’re reading this blog. You’ve probably got it already. -The Homefront campaign has entered Block 2. The Sandmen score 2 Strategy Points. The Order of the Chimera scores 1 Strategy Point. The Council pulls up the rear with no points. For Factions, the Gremlins receive 2 Scheme Points. The Ten Thunders, the Resurrectionists, and the Guild all receive 1 Scheme Point. The remaining Factions score 0 Scheme Points. One assumes that the Neverborn’s votes were cancelled out by the Sandmen winning, but that’s the way the cookie crumbles. I’m actually a little sad the Council isn’t doing better, as I like the story behind what they are. Hopefully Council stuff finds its way into the game at some point in the future. -A new issue of Wyrd Chronicles has been released, with some good stuff in it. Rathnard put in an article for starting Guild on a budget, which I think will interest a lot of folks. There’s a Tactics article submitted by your humble bloggist discussing four masters who Broke Promises in the most recent book and the power increases they’ve received in exchange. 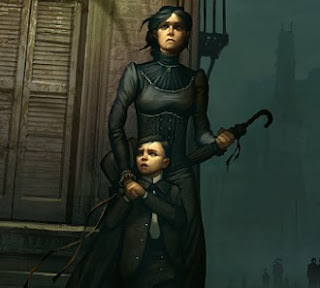 And there’s a fun Through the Breach scenario where your Fated take some kids for Trick-or-Treating in Malifaux. Hint: It doesn’t turn out well. Additionally, they announced that Lady Justice won the story event based off of Gencon sales. So, eat it Rezzers. I guess. We’ll get some fluff for what happened later. -Wyrd has announced the Get Gourd pumpkin carving contest. Carve a pumpkin with some sort of Wyrd theme. Post the picture. They’ll draw five random folks to get a Carver miniature, and they’ll vote internally on a winner to receive a Through the Breach Hannah. None of you reading this should enter, so I can win. Seriously, don’t follow this link. Don’t post pictures. I want 5 carvers and a Hannah. -Once again, I’d like to thank our Patreon supporters, Richard Nave, CobaltUnicorn, Kevin Tapper, John Spencer, and our newest patron Moritz Hampel. We’re halfway to our next goal, unlocking a Malifaux Musings Twitch channel for streaming games played over Vassal. And remember, if you’re signed up as a patron for even $1, you get an entry in our monthly raffle to win some kind of cool Malifaux limited models. This month’s raffle is an older Miss model from Gencon, Miss Terious, an alt Ortega themed Death Marshal. Additionally, I’ll be throwing in a Halloween surprise, some miniature Jack-o-Lanterns to be used on the bases of your models. And I mean, come on, it’s a $1. You’ve got a dollar, right? Just follow the link, throw us some shekels, and let’s see what we can build this thing into. 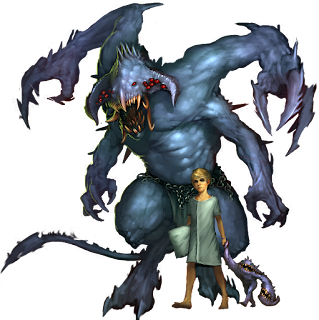 So I mentioned above the Tactics article I wrote for this month’s Wyrd Chronicles, and one of the issues I ran into with my plan was this: I was going to write about the Dreamer (or, more properly, his patron Nytemare) and how he had screwed over Lillith in the Neverborn story from Book 5. The idea was that I would then talk about the upgrades and models from the book that boosted their power level, ostensibly as a reward for breaking their promises. Here was the thing: it’s obvious what Dreamer got in Book 5. Growing up and Sleep Cycles lets you play him as a melee master that swaps back and forth between the little Clockwork Orange wannabe and LCB. But when it came to models, there wasn’t a ton that jumped out and screamed “this is specifically of use for Dreamer.” Serena Bowman was there, of course, and she has some synergies with him, but I was a little lost on what exactly she was supposed to do. Give models Nightmare and Black Blood? Ok…why wouldn’t you just have Lelu and Lillitu? But then I heard the Arcane Reservoir podcast episode discussing the Neverborn and, specifically, heard them gush about how solid the Bultungins seem to be for their cost. This tends to be a bit of a blindspot for me: I can see the super awesome high-costed models and can picture their role, but I miss at times how effective low-cost stuff can be. And then it hit me: Bultungins get a free (2) ap attack when they get pushed into melee range by another model’s actions. What crew has a lot of those? Well, Dreamer has Empty Night and Daydreams have Lead Nightmares, but Bultungins aren’t that...except when you have Serena, and she gives them an upgrade so they count as one. And thus, this crew list was born. So the main theory here is to use the numerous pushes, pulls, lures, etc. that are available in the base crew to lead the Bultungins (little kids) around the neighborhood so they can trick people (smash them with big axes.) I wanted to test Growing Up, so I included it even though the summoning upgrade is probably better. It makes sense with the theme as well, as we know that Dreamer has developed a fondness for going around and smashing pumpkins with his new cricket bat. From the Shadows on the Bultungins can be used to get them up into an early strike/surprise position, but I don’t know that it’s really necessary. Plus, the benefit of leaving them close by is that you can target them with Serena’s “The Things I’ve Seen…” and give them Black Blood (while hopefully also triggering to put Black Blood on other stuff, like the Dreamer himself.) That would be your Treats that your crew is handing out to the other whenever they get hit. I played this with Jon’s Parker crew on Vassal a few nights ago using a version of Gaining Grounds 2018…from several weeks ago. We set the game up then, and only just finished it Tuesday, so of course many of the schemes had changed (and one no longer existed.) So I’ll not belabor the details of the game (and this is certainly not because I lost. You’d be a fool to think so.) I was kind of surprised in game which parts of the crew worked and which parts didn’t. Fortunate draws let me hit Serena’s trigger so that, by the time combat started in earnest, I had made two of the Bultungins, the Dreamer, and the Doppleganger have Black Blood. This let her serve as a reasonably effective force multiplier later on in the game. Also, using the Daydreams and Dreamers’ pushes to throw the Bultungins into combat worked surprisingly well. What I needed to do was A) Equip the Dreamer upgrade to give him accomplice and B) Remember to use Accomplice when possible (IE with the Daydreams.) At one point I left a Freikorps Librarian on 2 wounds from a Savage Mauling attack but forgot to Accomplice and finish him, and that Librarian’s heals would plague me the rest of the way. Even better, Dreamer’s Empty Night lets you push, attack, then triggers the Savage Mauling as well! That’s pretty spicy! On the other hand, Dreamer’s LCB shenanigans really didn’t end up doing what I wanted at all. I’m not that experienced with him, so in my head I thought I’d be floating up to Waking +4 and popping out the big guy every turn or something. I only really could do it 2 out of the five turns, and he didn’t do as much damage as I was hoping when he was out there. On the other hand, the cricket bat+summoning+ranged attack+Empty Night made for a pretty versatile, solid all-around master, which I also didn’t expect. There are a few changes I’ll probably try out with this crew. Obviously, working in the Accomplice upgrade will be important. I think the Summoning version of Dreamer may almost be better at this after all, as Dreamer was kind of stuck between wanting to support his crew and wanting to get stuck in every turn. I think a more focused crew could actually be pretty solid. As stated above, this is an excerpt from a story I’m writing about the recruitment, training, and eventual early missions of a Death Marshall named Burns from the early days of the second Breach. I hope you enjoy. As a reminder, one of the perks of being a $5 or higher patron on Patreon is access to early drafts of my fiction as I’m working on them. Sometimes, I wonder if my answer would have changed if I could see the hell hiding behind those words. The Death Marshalls. It sounds ridiculous when you say the name out loud, like something from one of those cheap adventure novels they sell in the shops. I have a hard time imagining Lady Justice or the Judge ever saying it, let alone thinking it up in the first place. I would come to find out soon enough, however, that the ridiculous name fit exactly with the mission to which I would soon dedicate my life. Death Marshall. A law enforcement officer for the dead. Only a hole of a city like Malifaux could need something like that. Of course, at the time the name meant nothing to me. The grim faced coffin-slingers with which the average Malifaux citizen is today familiar had yet to make their appearance in the streets in those early days. Most of them were like Vinton, a man in a relatively fine looking duster with a shiny new gun and a shinier, newer badge pinned to his chest. I almost laughed in his face, but reminded myself that this was my only ticket out of this cell. I tried to play it coy, but we both knew my answer before I ever gave it. All it took was a nod of ascent, a word from Vinton to the Guardsman posted at the end of the hall, and I was out and freed. There wasn’t even any paperwork to sign, and for the Guild that is really saying something. What happened after that? Sometimes I’m not sure I remember it rightly. Other times it’s all I can do to drive the memories out of my head. Imagine the worst physical exertion you’ve ever experienced, coinciding with mental stress designed to push you to your limits before shoving you so far past them you forget they were ever there in the first place. 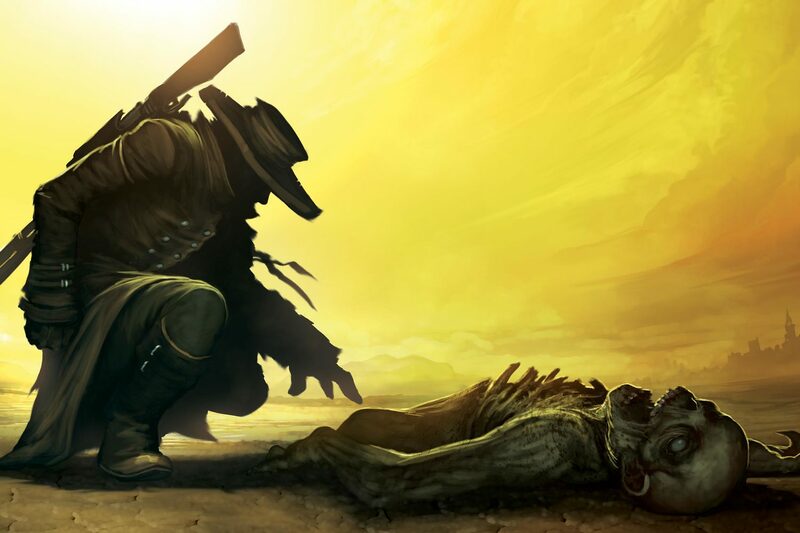 It was Hell, if Hell gave you the option to quit at any time, so long as you were alright with being executed. We drilled our bodies to the point that they were an interconnected series of scar tissue and hard, lean, whipcord muscle. We drilled our senses until we could spot the tiniest signs of necromantic magic, even while being shot at. And our minds...well a Death Marshall’s mind has to be a fortress, since the gift of necromantic magic also tends to come with an ability to warp people’s perceptions or fill them with terror beyond the mortal ken. We were subjected to constant mental assault, often when we were in the middle of some other exercise, and never with warning. Some of the magics they used on us would earn an average citizen a bullet just for talking about them. It was constant. It was unrelenting. It was torture dressed up as education. Many who went into the academy sane came out broken and cold, and those were the Marshalls who graduated. In our first weeks, our instructors encouraged us not to fraternize with our fellow recruits. I didn’t understand why, thought it was just some BS to keep us focused on our training. A young woman named Winters hit it off with me after the first day when she deflected my fumbling attempt at a wristlock and left me on my back with a knot the size of a potato growing from my forehead. She was a no-nonsense, balls to the wall soldier, one of the toughest people I’ve ever known. I watched her reset her own dislocated shoulder in the middle of a hand-to-hand combat drill and then go on to win the damned thing. She was one of the early guardsmen, first through the Breach when it reopened and, unlike many of her peers, actually still cared about keeping the people of the city safe. She should have been exactly what the recruiters were looking for, but they could see something I missed. She cared TOO much. It turned out she had been pregnant once, years prior. It was going to be a daughter if she hadn’t been stillborn. It was the sort of entirely mundane trauma that makes up the background of most people, but Death Marshalls can’t be most people. Our instructors filled our minds with images of failure: innocents murdered, children stolen, friends and family members lost as a result of our actions. It went on for months, and the rest of us didn’t see it eating away at her until it was too late. One morning they played reveille and she didn’t leave her bunk. The instructors went into the dorms to find her clinging to her mattress, a picture of some little girl she’d found and decided was hers clutched in one clawed hand. She had convinced herself that it was her fault these phantoms in her mind kept dying, and unless she hid herself away it would keep happening. She thought she had even gotten her daughter killed, though how she could have come to that conclusion I’ll never understand. As we stood in the drillfield listening to her howling shrieks, we knew it was too late for her before the instructors hauled her bodily out the door, two men dragging her by the arms. We didn’t even resent them for it when they took her behind the barracks and we heard the pistol shot. Frankly, it was the least they could do.